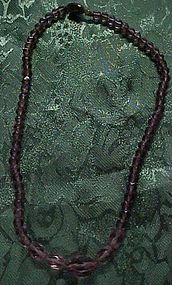 Very old string of glass beads with original amethyst purple glass matching cabochon on the clasp. Clasp is stamped Czechoslovakia. Necklace is made of faceted cut purple glass beads. Pinch and slide clasp works well. Measures 14" long.